The government's controversial Troubled Families programme could be given a more "positive" name, the minister in charge of it has a said. The programme - which was launched by then prime minister David Cameron in 2012 - was meant to "turn around" 120,000 families in England. A 2016 report found that it had no discernible impact on unemployment, truancy or criminality. Communities Minister James Brokenshire said it was now "showing real benefit". But he said he would reflect on the name of the programme to ensure it is not "getting in the way of the positive objectives". He was speaking about the latest evaluation of the initiative, which says it has cut the proportion of children going into care and the number of juvenile convictions. 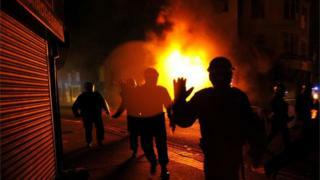 The first version of the programme was set up in 2012 at a cost of £448m in response to riots in English cities. This current programme was rolled out in April 2015 and is backed by £920m of government investment. It aims to help 400,000 families by 2020. Under the project, local authorities identify and support families with multiple problems including domestic abuse, unemployment, mental health problems and truancy. Central government funds local authorities to work with these families on a payment-by-results basis. In 2016 a report by the National Institute of Economic and Social Research said the initiative had had no measurable effect on school attendance, employment or behaviour. However, the government said an evaluation, published on Tuesday, demonstrated that the programme had reduced the proportion of children going into care by a third, reduced the proportion of adults going to prison by a quarter and had cut the number of adults claiming Jobseekers Allowance. Mr Brokenshire said: "Rather than responding to each problem, or single family member separately, assigned Troubled Families keyworkers engage with the whole family. "Through this approach they coordinate support from a range of services to identify and address family issues as early as possible rather than merely reacting to crises." Dame Louise Casey, who launched the Troubled Families programme but stood down in 2015, said it had "shaken up the way families with complex problems are supported, ensuring they are identified earlier to get the help they need."